You know when you meet someone who has read and loved the same book as you, and you both light up and eagerly compare favorite parts? When I meet someone who has listened to the same book, the same thing happens.Except times fifty. Because we audiobook fanatics are kindred spirits on a­­­­­­­­ whole other level. We’ve drunk the Kool-Aid. We’ve been pulled inside the fabric of a story by one unbelievably talented narrator after another, and it feels like a delicious kind of magic. We can’t wait to share our favorites with everyone we know. From the original books on tape in my Walkman, to CDs in my Discman, to Bluetooth in the car, listening to both fiction and nonfiction on audio has been a part of my life for more than twenty-five years. Man that makes me sound old! Every day for at least a little while, I get to take a break from the vortex of my own thoughts and listen as someone weaves a tale around me that only I can hear. I get to walk in someone else’s shoes at the same time as walking in my own. See? Magic. It’s been a joy to listen to my favorite voices bring my own books to life over the years. Between the Candymakers and Willow Falls series, Mark Turetsky and Kathleen McInerney have each narrated over thirty-six hours of them. And now with Bob, two new narrators step up to the microphone. Nora Hunter slipped into the role of ten-year-old Livy like she’d been inhabiting her for years. And I was thrilled when a narrator I’d gushed over for years was chosen to play our little green creature, Bob. It will now be hard for me to think about Bob without hearing Rob Dircks’s distinctive voice in my head. And that’s a very good thing! Together they bring a new depth to the book, making me laugh and cry even as my kids made fun of me since I’m half of the team who wrote it. 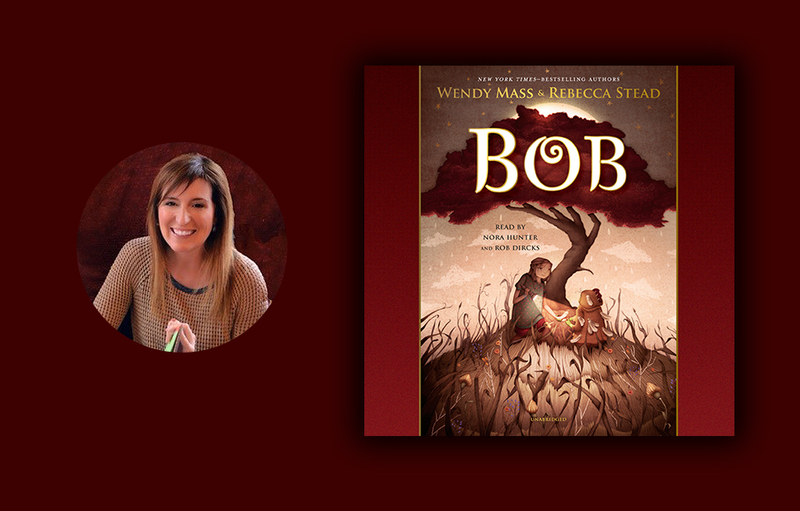 Rebecca Stead wrote Livy’s chapters, and I wrote Bob’s, but it turned into a pure collaboration and a labor of love. Livy and Bob haven’t seen each other in five years, and they have a lot of mysteries to solve: Why did Livy forget Bob? Why doesn’t he remember where he came from? And most important, where does he belong? Livy has to learn that she’s more powerful than she thinks—and so is Bob. I have no doubt listeners will feel their own power when they’re done walking in Livy’s and Bob’s shoes. Well, Bob doesn’t actually wear shoes. But you get the point. If this is your five-hundredth audiobook experience, I hope you’ll love listening to Bob. And if it’s your first, well, I just got a little shiver of anticipation for you. Bon voyage! And then I proceed to rattle off the list of titles she simply must try, until she moves to another row.